Richard Ford’s new book “Poems Written by a Government Prisoner in Georgia, USA” is an enticing work drenched in emotion. Recent release “Poems Written by a Government Prisoner in Georgia, USA” from Page Publishing author Richard Ford is alluring and entraps the reader until the end. Richard Ford, a first time author, has completed his new book “Poems Written by a Government Prisoner in Georgia, USA”: a gripping and potent collection of poems that depict life in prison. Published by New York City-based Page Publishing, Richard Ford’s profound collection of poems is riveting and full of feeling. In Richard Ford’s “Poems Written by a Government Prisoner in Georgia, USA” tells gripping poems of what life was like as a prisoner. These poems express what the author was feeling as he was writing these poems. 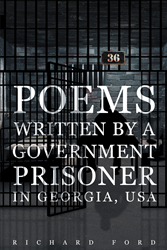 Readers who wish to experience this potent work can purchase“Poems Written by a Government Prisoner in Georgia, USA” at bookstores everywhere, or online at the Apple iTunes store, Amazon, Google Play or Barnes and Noble.